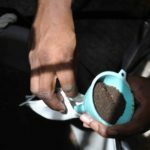 Castings are used in OurWorm Tea Bags and for making fresh OurWorm Tea. Castings are the purest form of the “excrement” of worms, approximately 50% pure, and aged upwards of 1 year. OurWorm Castings can be bought by special arrangement. Call or contact us! 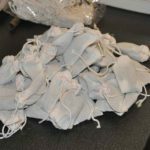 Worm Tea Bags – OurWorm Tea Bags are sold in re-usable cloth bags, holding amounts to produce 1 and 5 gallons of worm tea. The pictures above show Garry making 1 oz. OurWorm Tea Bags, which we sometimes give away free at Farmers’ Markets. (A 1 oz. OurWorm Tea Bag will make one pint of worm tea.) Individuals can produce their own worm tea by means of these handy bags, which have an expiration date of 3 months, if they are kept in a cool, dry, dark, aerobic environment. Each OurWorm Tea Bag comes with instructions on proper usage. How do you approximate 50% purity?